Buttery, David. 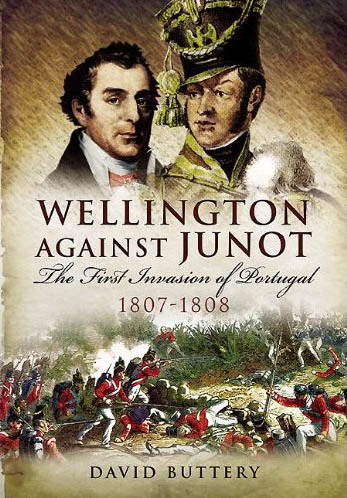 Wellington against Junot: The First Invasion of Portugal 1807-1808. Barnsley: Pen & Sword Books, 2011. 238 pages. 35 illustrations, 8 maps. ISBN# 9781848841420. £20/$39.95. Hardcover. Between 1807 and 1811, French forces invaded Portugal three times. Although initially successful – including capturing the capital in 1807 – each invasion failed and the French were ejected from the country. It can be argued that the French failure to take and hold Portugal was instrumental in the eventual downfall of Napoleon, since it gave the British a place on the continent to fight to the French. Three years after ejecting the French from Portugal the final time, the Anglo-Portuguese Army had taken the fight to southern France. Despite the importance of the hard fought campaigns for Portugal, very little has been written about since Sir Charles Oman wrote his massive History of the Peninsular War close to 100 years ago. Osprey Books has published a series of studies on the different battles, such as Bussaco, Vimeiro, and Fuentes de Oñoro, but no one has looked closely at the three invasions that devastated Portugal. Mr. Buttery has ably filled this void with his two books Wellington against Junot and Wellington against Massena. Mr. Buttery uses the same approach in both books. They are campaign studies as seen through the eyes of the commanders. He begins with an overview of the situation both in Europe and the Iberian Peninsula and provides insight on why Napoleon decided to invade Portugal – a relative backwater of Europe. He then devotes a chapter to each of the commanders, their capabilities, their weaknesses, and why they were chosen for command. Throughout the book, Mr. Buttery examines their actions and decisions and the impact they had on the campaign. Errors were made on both sides and he does not pull any punches. Although he is highly critical of Junot’s and Massena’s handling of the various aspects of the campaigns, he does not spare Wellington either. All and all, his assessments are well thought out and balanced. Both books are well organized and the author keeps the pace moving with an exciting narration that does not bog down with too much extraneous detail. Several things stand out in these books. First is his ability to tell a good story. His descriptions of the hardships the French went through are quite harrowing, while his battle descriptions very well done. He has a knack of being able to put the reader in the midst of the fighting. The real strength of these books however is the author’s in-depth examination of the command problems both General Junot and Marshal Massena experienced. The French did not have the unity of command that one would have expected, and many of the problems that caused Marshal Massena’s campaign in 1810 and 1811 to fail can be attributed to his ability to control his subordinates. Mr. Buttery draws heavily on primary sources to tell his story. He does not limit himself to just the British perspective, but quotes French sources extensively to show the campaigns from the French point-of-view, especially when covering the inner workings of the French headquarters. Furthermore, instead of just trotting out the usual British memoirs and diaries, Mr. Buttery mined the National Army Museum and other archives for previously unpublished accounts. Another thing that marks these books out is the numerous maps they contain. The battle maps are easy to read and well-placed in the books so that the reader can follow the action in the narrative. 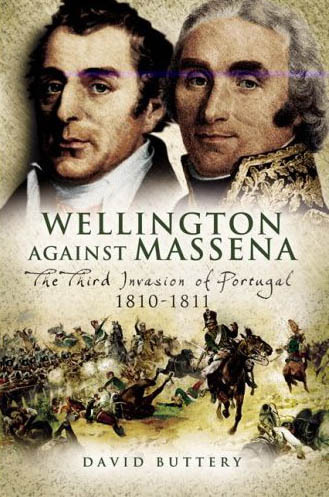 Although the maps charting the progress of the campaign in Wellington against Junot are very useful, unfortunately there are none in Wellington against Massena. This leaves the reader on his own to determine where the events took place. Mr. Buttery closes each volume with a guide to the various locations mentioned in the book. He provides detailed information on how to get to each site and what is there to see. Wellington against Junot and Wellington against Massena are well-researched, but contain two noticeable weaknesses/errors. The first is that neither book contains an order-of-battle for the forces involved in the campaign. They would have been a nice addition. The second problem is a relatively minor, but still glaring error. Mr. Buttery repeats a mistake other authors have made. . . His account of Fuentes de Oñoro is marred by his insistence that the French Foot Grenadiers of the Imperial Guard were present at the battle. This is most likely due to his reliance on British contemporary sources that assumed the famous regiment was there, because they saw French soldiers wearing bearskins instead of shakos. . . which at the time some grenadiers of French line infantry regiments still wore. David Buttery should be commended for these two well-written campaign studies. They provide a superb introduction for those interested in the French campaigns in Portugal! Hopefully he will complete the trilogy with a study of the second French invasion of Portugal – that of Marshal Soult’s campaign in northern Portugal during the first half of 1809.